1.Preheat oven to 350°. In small bowl, combine oregano and garlic salt. Working in batches, place 5 tortillas in single layer on work surface; spray both sides of tortillas with cooking spray; evenly sprinkle with oregano mixture. Stack tortillas; cut into 4 wedges. Repeat with remaining tortillas. to wire rack to cool. Repeat with remaining tortilla wedges. Makes 80 chips. 3.Meanwhile, in large saucepot, heat 1 tablespoon oil over medium-high heat. Add kale, spinach and salt; cook 5 to 6 minutes or until wilted, stirring frequently; strain, pressing with back of spoon to remove excess moisture. 4.In same saucepot, heat remaining 1 tablespoon oil over medium-high heat. Add onion; cook 6 to 8 minutes or until tender; remove from heat. Stir in garlic, Neufchâtel cheese, cream cheese, sour cream and pepper until well combined. Stir in 3/4 cup mozzarella cheese, 2 tablespoons Parmesan cheese and kale mixture. Spoon kale mixture into 1-1/2-quart glass or ceramic baking dish. Sprinkle with remaining 1/4 cup mozzarella cheese and 2 tablespoons Parmesan cheese. Bake 45 to 50 minutes or until bubbly and top is browned. Makes about 5 cups. 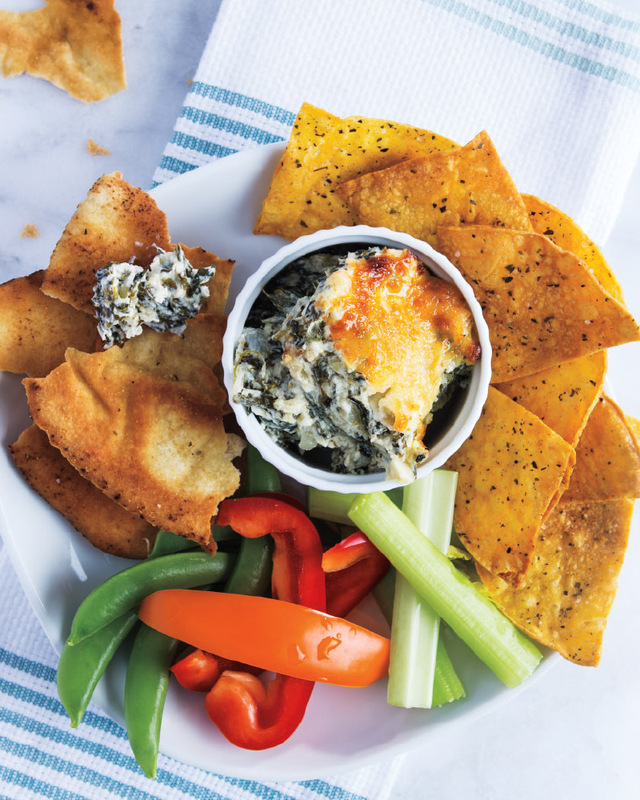 5.Serve dip with tortilla chips or Pita Crisps. Serve along with fresh veggies like carrots, cucumbers, celery, sugar snap peas and/or bell peppers. > This is a great way to try kale for the first time! Try swapping sour cream for plain non-fat Greek yogurt for an extra protein punch, an increase in vitamin B12, and to reap the benefits of probiotics found in yogurts with live active cultures.